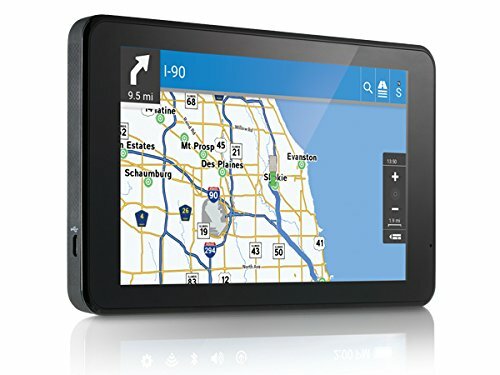 What is the best truck gps? A bright and large screen – best size would be 7 inch. Have a very precise touch screen – a capacitive touchscreen is the best option. Be resistant to shocks and temperature variations – a truck gps must be more reliable than an average one. Must have updated truck maps and free updates for those maps – do not buy unless it features that option. Maps need to be extra detailed and contain all point of interests for truckers. Make precise navigation routes for the specific weight and dimensions of the truck. Also, it must warn about all restrictions and find the most efficient routes for saving time and fuel. If it is possible, choose a truck gps that has a TMC or Bluetooth connection. With the help of these, you can get the latest weather, traffic and other road conditions – those are useful tools for any truck driver. Must include points of interest for truck drivers such as truck parking, industrial parks, power stations, or toll stations. We chose for you 5 navigation systems that have all the options for a truck driver: detailed maps, truck restrictions, quality screen and a solid build. Pro: An almost perfect gps for truck drivers. 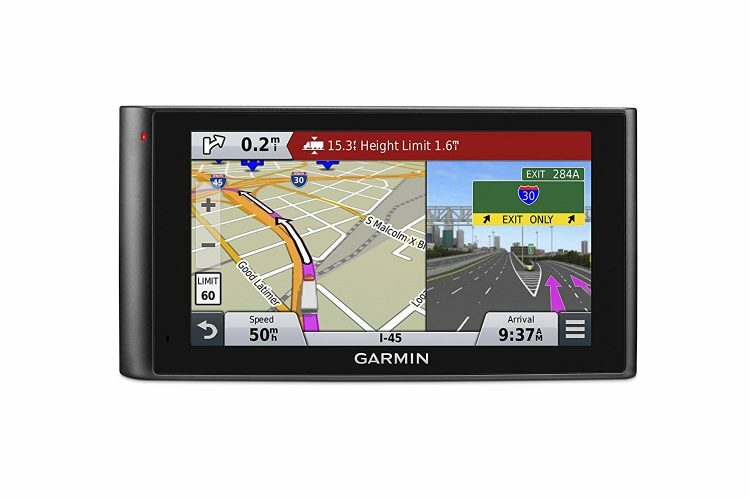 Comes with detailed maps, warning restrictions and a very bright screen. Free map updates are available for every quarter. Cons: It does not support postal code search. Pro: You get customized routes for your vehicle type, size, weight, cargo and speed. Also, you have free Lifetime Truck Maps. Cons: it has some map errors and shows wrong POi's for truckers in some areas. Pro- This truck navigator has a capacitive touch screen allowing gesture control. It also features a built in dashcam and preloaded truck maps. It has free map updates. Cons- some users reported lag and device freezing. Pro: Provides basic functions for truck drivers. It can track maintenance, hours of service, fuel use and also provides customized routing for the size and weight of your truck. Cons : you need a paid subscription for some services. Pro- This truck satnav has a good configuration and preloaded truck maps. 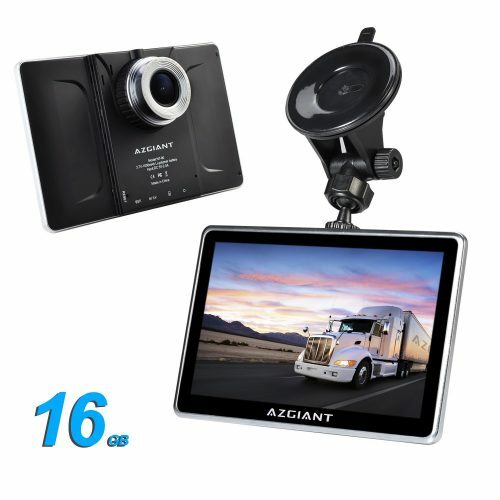 It features a DVR camera, great for hazaard prevention and recording. Android is very flexible and allows installation of various truck apps and other software. It includes WiFi connection and a web browser. So you can make a hotspot from your smartphone to Az Giant and get the latest traffic informations via Google Maps. Cons- some users reported routing errors. So, what are the best features of a gps used for truck navigation? As we said, the screen must have at least 7 inches for comfort and ease of use. A smaller diagonal makes it difficult for the driver to observe the route details and map information. The best touch screen used in GPS is a capacitive one, but this type of touchscreen is more expensive. The capacitive touchscreen is similar to the one used on smartphones, and allows gestures such as pinch or swipe. Most truck gps have a resistive screen that does not allow gesture control. A truck gps stays on for long periods of time. A good battery is needed that does not warm up after hours of use. It has to withstand the warmth of the windscreen as well as low temperatures when driving in winter conditions. Of course, a truck gps must have solid case and a high quality charger that does not deteriorate when using intensively. 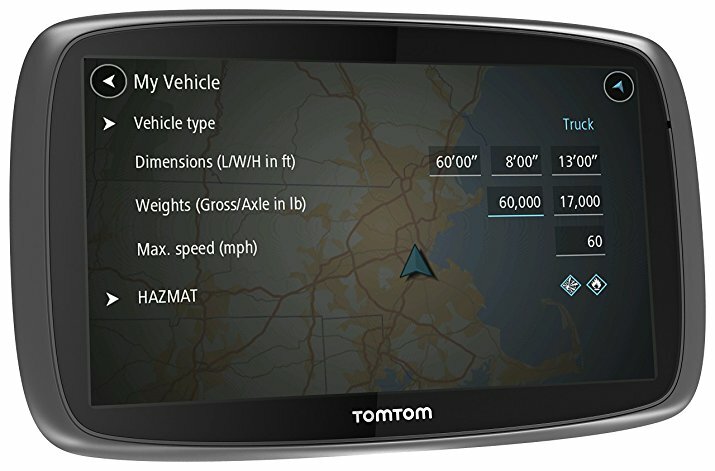 Tomtom and Garmin produce dedicated truck gps systems using Linux as operating system. Next, we have other brands on the market like: Becker (with Windows CE operating system) or Rand McNally. All of the above are well-optimized by the manufacturer, have free updates to truck maps but they also have a steep price. The second category of gps includes non-brand Windows CE devices on which you can install a free truck navigation program and related maps. Third, we have Truck GPS with Android as operating systems. On Android Truck Gps systems, you can install any app available on Google Play. Other come with preinstalled software like Here Navigation or Waze. Let’s talk about the processor and the memory of a truck gps. TomTom or Garmin truck gps come with a processor and memory optimized for your own software so you do not have to worry about it. Of course, older devices are difficult to use as a truck gps, but there are methods to install free truck gps maps on your old TomTom gps. If you intend to buy a truck gps without maps and use truck free software, you must pay attention to the hardware specifications of the navigation system. A good truck gps that can handle a popular truck software like iGo Primo Truck, should have a minimum 800 Mhz processor and 512 Mb of RAM. Those are requirements for running any truck software on a Windows CE navigation system. Android navigation systems are similar to classic tablets and just have some features that make them a bit different from a classic gps. An Android truck gps should have a good quad-core processor, 1.5 gb or 2 Gb Ram memory and a minimum storage of 16 Gb. Even if the memory can be increased by external storage, it is preferable to run the navigation software on the internal memory for stability. Some top notch Android devices for truckers have mobile data connection, useful when you need traffic or weather alerts on the route. Truck drivers need a reliable gps. A robust navigation system that offers all the options presented above. Maps and restrictions for trucks must be displayed with great accuracy, knowing that a truck that gets on a wrong way can get stuck in traffic or the driver might receive a consistent fine. A truck gps calculates routes according to vehicle parameters. It takes into account the length, width, tonnage, axle number, trailers and truck type, and with this data an optimal route will be generated for the desired destination. Each manufacturer uses its own truck software. Tomtom has some very good gps models for truck drivers. Four free map updates are received each year and there is also the Mapshare option with which users can correct the truck map in real time. 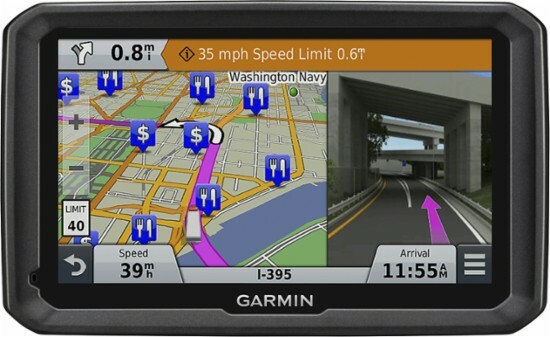 Garmin is an extremely well-known global brand. Just like TomTom, Garmin offers quality truck gps. Free map updates are provided for life and updates are available 4 times a year. What remains to be done? Start looking at available products in stores and check which truck gps meets most of the conditions outlined above. Do not go on for the cheapest one, just choose a truck navigation system that you can rely on.